It was more or less clear that Microsoft's upcoming web browser Internet Explorer 10 would not support Windows XP, considering that Internet Explorer 9 did not support the operating system as well. Windows Vista users on the other hand were caught by surprise that their operating system would not be supported by IE10 as well. You may install and use any number of copies of the software on your premises to test how it runs with your programs on Windows 7 Operating Systems. 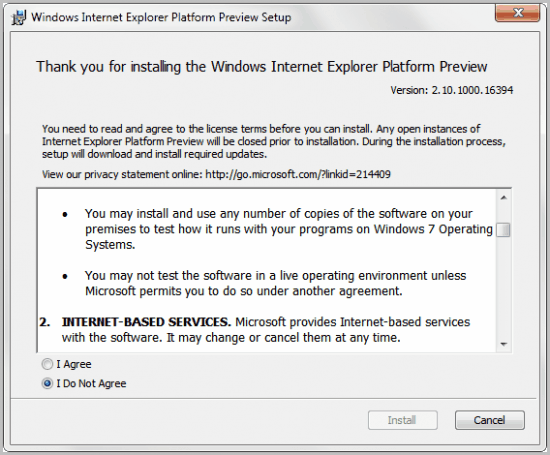 The Internet Explorer Platform Preview requires Windows 7 (x86 or x64) Operating System. Platform Preview 4 and later require updates to be installed on Windows 7 systems, after which your computer will require a restart. Windows Vista users who try to install the platform preview of Internet Explorer 10 get the message that it does not support any operating system earlier than Windows 7. Does that mean that Internet Explorer 10 will only run on Windows 7? For now it does, but it will change with the release of Windows 8. It is rumored that Microsoft will ship Internet Explorer 10 with Windows 8, which means that the browser would support both Windows 7 and Windows 8. While there are not that many Vista users left who can be irritated by Microsoft's move to exclude their operating system from the next version of Internet Explorer, there are some who have criticized Microsoft for that decision. Microsoft's official response, according to Computerworld was that they are continuing to drive innovation by utilizing improvements of modern operating systems and modern hardware. Is this now Microsoft's attempt to lure Vista users into upgrading their operating system? While it may look like that on first glance, it is unlikely that any user would upgrade the operating system for a new web browser, especially since there are numerous alternatives available. Concentration on Windows 7 and Windows 8 could on the other hand lead to improvements if Microsoft manages to utilize features that are native to those operating systems. For now, we are left in the dark what those might be. An educated guess would put touch capabilities at the top of the list. What are your thoughts on Microsoft's decision? Oh, and take a look at Mike's article on the first preview release of Internet Explorer 10 if you run Windows 7 or an early version of Windows 8. Previous Post: « Get the First Preview Build of IE10 Today! I wasn’t to too happy when I upgraded to Vista and found that most of my hardware was incompatible with it, despite the devices not being very old. I also didn’t like UAC prompting me everytime I ran an app it didn’t like, with no way of over-riding the prompt. If I know the App, I’m going to click continue everytime anyway, so why not let me choose to override the prompt for that app? That aside and despite widespread criticism from pretty much everyone about Vista, I get on well with it. I also use a Windows 7 machine, but prefer Vista as it’s more like Windows 2000. I think that Microsoft are making user interface changes just for the sake of changing it, but they’re actually take a back step in doing so from a user perspective (that goes for Office as well, as I can’t stand the 2010 Office Interface). I’m familiar with the “Secretary with a typewriter” analogy, but come on! The user interface aren’t an improvement. If they discontinue browser updates for older versions such as Vista, then many home users will either leave it as it is, or just use Firefox instead. As for the corporate users, well they will just make do with what they’ve got anyway. I think Microsoft are pushing upgrades too aggressively. Never upgrade an operating system. If it came with Vista, it stays Vista. If you want Windows 7 or 8, buy a new computer. BTW I use Vista and am very happy with it. Never a problem. Of course, I never tried to upgrade from XP and never tried to port software from XP to Vista. Don’t do that. If you want upwards capability, then get a mainframe. IBM Mainframes are very good at compatability to previous versions. Some are still running code that was written in the 60’s and 70’s. Really. Vista is Microsoft’s new Windows ME. Both were faulty and PR nightmares. They are trying to bury Vista the same way they did ME. Give them a couple of years and you’ll be hard pressed to find any mention of it. Vista is finally meeting the same fate as XP. to upgrade their thinking is seriously flawed. to alternative browsers for new features. As a developer I can see no reason IE9/10 can’t run on XP and Vista, apart from Microsoft actively blocking it for marketing purposes. Moreover, why isn’t IE10 available for competing platforms (Android, iPhone)? 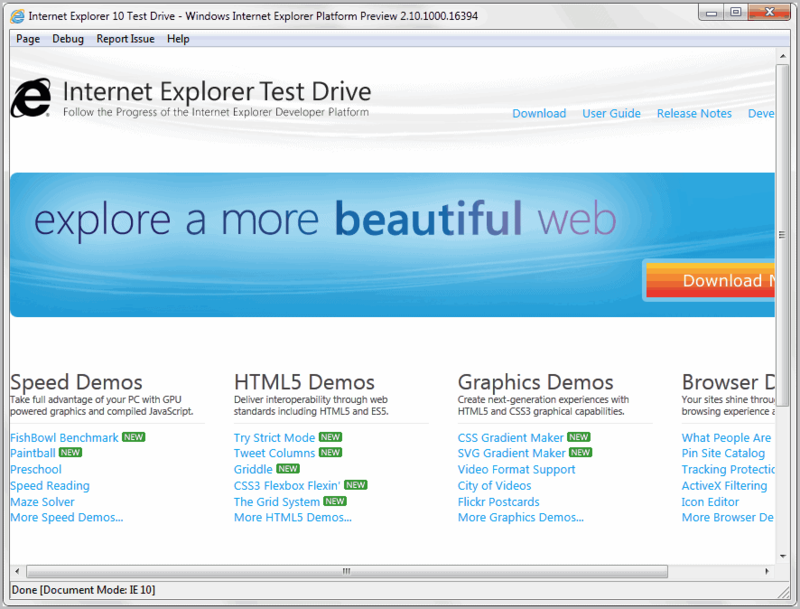 If Microsoft are serious about IE they need to provide a seamless experience regardless of the platform you’re using. I would have loved to have IE on my Samsung Galaxy S3, but I couldn’t. So I used Chrome, which got me comfortable with it, so now I’ve started using on my Windows devices. I also support businesses, none of which would see any benefit in upgrading to Win8 just for the browser. I have many clients still running XP machines. Sure, new machines come with Win7/8, but machines won’t get replaced just because Microsoft wants to ditch XP and Vista. Everyone’s just moving to Chrome/Firefox. A couple of clients are even moving away from MS Office, lured by Google’s integration with Chrome over multiple platforms (as I already mentioned) and it’s people like me who support them and actively promote Chrome as a viable alternative to IE. Watch out Microsoft – you’re not only alienating businesses, you’re actively forcing them to move to competing browsers! And to finish I’d just like to say one thing: I love IE! I wonder what’s missing in Vista that is available to be used by Explorer 10 in Windows 7? I thought Vista and 7 were basically the same. Martin, do you kwow any good Adblocker for IE? I think that is true for Preview version only. I guess the final version will support Vista as well. Windows 7 is just an improved version of Vista. Core elements are basically the same. So there are no reasons to exclude the support of Vista for IE10. I downloaded and installed Firefox and it upgrades automatically so no use for going to a firefox website to upgrade to current versions. However, I still have IE 8 on my computer. I’m wondering if this is causing any friction between the two and could it be slowing my computer down. The thing that I would want to do is to totally uninstall IE, but am afraid it will cause my computer to not work properly or make it crash altogether. Windows XP home edition (already installed on my computer when I bought it in 02) is the operating system and I hate it. When I look for a new computer, what are the operating systems availabe that will always give me the opportunity to keep my computer up to date and will allow me to use just one browser instead of having two on my computer like I have to have now (IE and Firefox)? From all of the reading of IE 10, I’m assuming given that I have Windows XP Home Edition, I wont be able to use IE 10?? am using windows xp home edition, can i install IE10 will it supports without causing any harm to my PC and one more thing i need to know that, may i use multyple browsers like (google chrome, firefox, etc),,,,,,,,,,,,,,,,,,,,……………………….. I have Windows XP Professional.with IE 8. I keep getting told to upgrade to a newer browser. Do I need to upgrade the operating system and the browser? I don’t understand. If IE10 won’t work with XP, what are my choices? I’m suprized at this, i have a a really old evo N1015V laptop from HP ive been trying to upload google chrome on it and it it wouldn’t install, i tried installing IE10 and IE9 on the old laptop non installed. Now i know the reason why after reading this article.